Going back to review a new edition of a product one has already reviewed is often an interesting exercise. A significant part of the interest comes from seeing whether the changes introduced into the new edition have noticeably altered one's opinion. In case of Geoffrey McKinney's Carcosa, whose original edition was self-published in 2008, and which I reviewed over the course of four posts, I largely stand behind by initial assessment, namely that Carcosa is a frustratingly eccentric work whose primary virtue is also its primary flaw: a rejection of the (often unstated) moral structure underpinning Gygaxian D&D. It's this rejection, I think, that's at the heart of much of the controversy surrounding Carcosa, which attempts to present a stark, even bleak, interpretation of Lovecraft as the basis for a gonzo science fantasy setting filled with serpent men, gray aliens, Great Old Ones, and Jack Kirby-style science-as-magic. Go ahead and read those original reviews, if you're unsure of the basic premise of Carcosa and what it includes. The new edition, published by Lamentations of the Flame Princess, and available as both a gorgeous hardcover or PDF, differs primarily in presentation from its 2008 edition, though there are changes, about which I'll speak shortly. Purely as a physical artifact, Carcosa (2011) stands head and shoulders above its predecessor. Indeed, it stands head and shoulders above most other recent gaming products I've purchased. 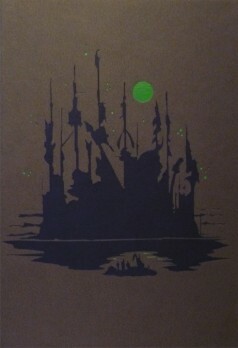 Its cover, which you can see here, depicts a silhouette of the mysterious city of Carcosa after which the book is named. The image is embossed on leatherette that feels right when you hold it, like some ancient tome of forbidden lore. Also right is the fact that the book has no title or identifying marks on it besides the above image and a sigil on the spine. In addition to making Carcosa look like a grimoire (but not in the gaudy way many RPG books have attempted this in the past), I also found myself reminded of early editions of weird fantasy books by authors like Abraham Merritt, William Hope Hodgson, and Arthur Machen, which I suppose was probably part of the point. The interior of the book is similarly attractive. The pages are thick and off-white in color, again suggesting a libram of black magic. The layout is clear but varied -- sometimes a single column, sometimes two, sometimes more elaborate -- and makes good use of color (green and purple). I'm not especially fond of some of the title fonts, which are occasionally hard to read at small point sizes, but I don't think that seriously undermines Carcosa's esthetics, which I think are nearly perfect. To that end, there are illustrations by Rich Longmore throughout, depicting many aspects of the savage world of Carcosa. I was initially somewhat skeptical of the inclusion of any artwork in the book, feeling it'd undermine individual imagination, but, having now seen Longmore's work, I'll readily admit to being wrong about that. I think the artwork does a superb job of fueling my imagination, in large part because it helps ground Carcosa rather than leaving it to float in some ethereal realm. Longmore is the perfect artist for this purpose, too, since his dark, realistic style provides some much needed weight to elements of Carcosa that might be goofy in other hands, like the dinosaurs and robots. Carcosa (2011) is an expansion of its predecessor and, for my money, the expansions do a lot to make the setting both more playable and more palatable. Chief among the expansions are the hex descriptions of the Carcosa campaign map. Whereas Carcosa (2008) had terse, often single-line, descriptions like "1 Cthugah's Flame Creature," Carcosa (2011) adds a second encounter or point of interest, which helps, I think, in providing some depth to the setting. Likewise, some of these descriptions include small, off-hand references -- "9 Irrationalist Space Aliens" -- that encourage further development and expansion, something I appreciate in sandbox setting hex descriptions. Also included among the expansions is a starter adventure, Fungoid Gardens of the Bone Sorcerer, originally published in Fight On! Starter adventures are always useful, since they let the reader know what the creator thinks you're supposed to do with his creation, thereby providing a model to emulate. In a setting as weird as Carcosa's, I think this is essential. Geoffrey McKinney has penned a new essay, "Humanity on Carcosa," which offers some insight into what it's like to live on Carcosa amidst all its Lovecraftian horrors and extraterrestrial entities. It's pretty bleak stuff, in my opinion, and reinforces the notion that I could never run an extended campaign in the setting. At the same time, I am grateful for its inclusion, since I believed in 2008, as I do now, that a setting like this one demands some "designer notes" to properly get a handle on it. "Humanity on Carcosa" is brief and doesn't explain everything, but it goes a long way toward making explicit some of the thinking behind the setting. A series of random monster tables is another addition in the 2011 version that contributes greatly to playability. Taken together, Carcosa (2011) is a very impressive package and a good example of where I think an amateur effort was noticeably improved by more "professional" presentation and production values. Purely as an object, I think Carcosa (2011) may be the most attractive old school RPG product I've seen and a vindication of James Raggi's often-eccentric esthetic. As a RPG, I think Carcosa (2012) still remains somewhat frustrating, at least to me, largely because it is written from a viewpoint so alien to my own. That's almost certainly a feature rather than a bug for most people, including its author, but I can't deny that I continue to find Carcosa too bleak and nihilistic a setting for my tastes. It's not just a "hard" setting; it's a hopeless one and, girly man that I am, I'm not much interested in hopelessness in my pastimes. On the other hand, one could reasonably make the argument that its bleakness is in fact a perfect emulation of Lovecraft's worldview, where mankind is cosmically insignificant and knowledge is a double-edged sword. If that's what one wants, Carcosa delivers it in spades. Buy This If: You're looking for a Lovecraft-inspired swords-and-sorcery setting and don't mind a heavy dose of bleakness and amorality. Don't Buy This If: You prefer your fantasy settings tinged with at least a little bit of hope. My assessment pretty much matches yours, I use quite a bit of it for my Zharillia campaign but it's not nearly as bleak as Geoffrey's. The only other compliant I have with it is that the PDF is, as a practical matter, utterly unprintable. It's formatted two pages to a PDF page which means that it can't be effectively printed booklet style because it doesn't paginate properly and it can't be printed in standard format for spiral binding either - your only option there is flip-up but then you have to either print the obverse page upside down to read it flat or flip the book over every page. It's really frustrating. The PDF is formatted to maximize its utility as a PDF -- not as a cheapie way to print the book. If you want a print version, why not buy the book? It's formatted to maximize its utility as a book. Carcosa is 288 pages. I don't see that working as a "booklet" regardless; you'll save money by just buying the printed book. @Ed: Except it's not very useful as a PDF, either. The format makes it completely unreadable on my Kindle DX or my wife's iPad, for example, without a lot of fiddling around. And the page numbers are synched properly so using it on a PC is cumbersome, too. The printed book is one of the most beautiful and usefully cross-referenced RPG books I own. But the PDF is badly, badly flawed. No, it's formatted to maximize its utility as a PDF on large wide-screen monitors, which is a very different thing. As Justin above pointed out, it's useless on an iPad, Kindle or (in my case) Nook Color. It can't be taken to a printer because of the pagination issues. Not to mention, I know how to make books, I'm very good at it, and regardless of the cost (it's usually cheaper when I do it anyways, the equipment I have is paid for) it's something I like to do. As such, I own the PDF, but it sees almost no use because the ways I like to interact with PDFs are not supported by the format it is in. This is a really big deal to me, it's frustrating to have a product that, were it to conform to standards would be wonderful. The PDF does not conform to standards and it is an issue. Why isn't there be a single page per PDF page version for people to read on small screens or print out parts of the book that they need? As a printer myself I will second that the pdf is less than useful both for printing and general use as a pdf. Single pages is always best both on PC, in print and on e-readers. I can't think of a single reason why having spreads is useful. So you can see two pages on a widescreen monitor? Okay...but it just makes everything smaller. I'd rather have a single page on fit-to-screen and not have to squint. The linking in the pdf is incredible though. I'd like to see more pdf based products do this. "...it's formatted to maximize its utility as a PDF on large wide-screen monitors..."
It's ideal on my small wide-screen monitor, too. But I see your point. Desktop & laptop monitors are all I was thinking about. I didn't even consider how it'd work for rich folks with their iPads, Kindles, Nooks, and such. And, frankly, I couldn't possibly care less. I figure, if somebody can afford a fancy mobile device, then they can afford to buy Carcosa as a book. Roger, have you tried asking James Raggi for a single page per page digest style PDF? You never know, it might be easy for him to knock out. I agree with you, by the way, though it's not quite as big a deal to me. But I actually really like digest-sized PDFs precisely because they fit the iPad screen so well. Hrmm, you made me look back to see. The only thing I did was + him on a post when Carcosa came out. Heck, he's in my circles on G+, I'll ask him right now. DUH. Don't forget tell us if a single-page format PDF is in fact possible. It's something I'd definitely prefer myself. "The Carcosa PDF has been updated. Instead of displaying in page spreads as a default, it has now been changed to display single pages." Awesome. I'll be downloading the file that actually works properly. As a reference for people like Ed: If you're using Adobe Reader you can go to View -> Page Display -> Two-Up and get properly formatted PDFs to display in two-page spreads. Every other PDF reader I'm familiar with features similar functionality. This is why, even if the original file didn't have improperly synchronized page numbers, it still would have been a bad idea: It reduces utility without adding any utility. "As a reference for people like Ed: If you're using Adobe Reader you can go to View -> Page Display -> Two-Up and get properly formatted PDFs to display in two-page spreads." Yup. I explained that myself, in a reply below, four days ago. While I agree with almost all of your assessment, I'd just like to point out that, while the world of Carcosa does seem bleak, amoral & hopeless, play in that world needn't be any of those things. Just like in real life, you don't have to go along to get along. You can choose to fight the bleakness, amorality & hopelessness. And that, I think, is where the greatest potential for adventure on Carcosa lies. This is what I wanted to ask-- to what degree does the setting *demand* that characters adapt a particular worldview? I'm very skeptical of a claim that any game allows a range that even approaches real life. "...to what degree does the setting *demand* that characters adapt a particular worldview?" To no degree at all. First, a character would need to have an EXTREMELY unusual background to be able to know more than just the slightest bit about the overall situation on Carcosa. So there's no reason why that situation should affect the worldview of any but the most extremely unusual of characters. Second, even knowing that situation, there's no compelling reason to go along with it. Even the temptation of great power is fraught with the likelihood of eventual disaster. So how a character chooses to deal with the situation is still completely up to the player. "I'm very skeptical of a claim that any game allows a range that even approaches real life." But I thought that's what all tabletop RPGs do? In theory, yes, that is what RPGs do, and that is why I appreciate them. Apologies-- I got called away and really shouldn't have ended by comment on that note. BUT, in plain ol' D&D, someone who says, "you know, I'd like to go ahead and marry the barmaid and spend the rest of my days selling rocks with continual light cast on them and raising our children" (a pretty reasonable thing to do, according to real world sensibilities) is not really playing the game. Even though I enjoy pushing limits of D&D, and run a lot of my characters against the grain, they still go on adventures, and kill monsters, and collect magic items. "...in plain ol' D&D, someone who says, 'you know, I'd like to go ahead and marry the barmaid and spend the rest of my days selling rocks with continual light cast on them and raising our children' (a pretty reasonable thing to do, according to real world sensibilities) is not really playing the game." I disagree. They're still playing the game. They're just choosing to play it in a way that we find really boring. "Even though I enjoy pushing limits of D&D, and run a lot of my characters against the grain, they still go on adventures, and kill monsters, and collect magic items." It sounds like you'd enjoy playing in Carcosa just fine if you can settle for collecting alien artifacts instead of magic items. It sounds like a lot of adventures would come to town. For example, adventurers would probably come to your shop, and they'd probably be making trouble in the tavern for your wife's old workmates. (Or current workmates, depending.) You'd become one of the worthy town merchants and probably be asked to be on the town council, or at least the local guild/merchant discussion groups. You'd be interested in having the roads stay clear for trade, the crops staying good, and so forth. If the local teacher or healer got possessed, you'd definitely be moved to react. And then, there's your kids. what if they have strange destinies? What if they want to date elves? What if they want to date very dated elves who are thousands of years old, with bizarre goals that mortal humans find hard to understand? A lot of stuff probably happens in a small fantasy world town. Just like in a Western. I agree with your overall assessment as well, but find myself drawn to the world of Carcosa. Not sure I can run an extended game there either, but a couple of one-shot games for sure. It is surely food for the imagination though. Beautiful book too. Thank you for the review, James. The high-tech artifacts of the Space Aliens are mankind's ace up the sleeve. In what is perhaps mankind's only stroke of good luck on Carcosa, the Space Alien armada that made a hard landing on Carcosa had a lot of powerful high-tech stuff that humans can easily use (and steal). Laser cannons. Tanks. Submarines. Aircraft. Robotics. All the way up to nuclear weapons. I include stats for the Old Ones in Carcosa with the full expectation that PCs will sometimes fight against and even sometimes slay the Old Ones. The Old Ones and their minions will (in my mind), over a long period of time, get blown away by men armed to the teeth. Most importantly, sooner or later someone is going to nuke Shub-Niggurath, and then it will all be over save for the mopping-up. Since Shub-Niggurath is the source of the vast majority of monsters on Carcosa, taking it out will put an end to the generation of new monsters. As a fringe benefit, as Old Ones are destroyed, sorcery will ipso facto also be destroyed. That ritual that summons Nyarlathotep won't do you any good after Nyarlathotep is destroyed. Oh god, my brain is overloading with post-revelation Carcosa ideas. Conans and Cthuloids in stolen/reverse engineered space ships punching aliens across the galaxy. Humans were once a pest on a planet rich in elements useful to aliens. But the aliens stirred the hornets nest. Now their galaxy-wide empire is getting a kick in the teeth from a bunch of stick-wielding neanderthals who are spreading like a virus amongst the stars. What have we unleashed!? to what degree does the setting *demand* that characters adapt a particular worldview? Very little, except to the extent that Carcosa isn't a setting that explicitly lauds (let alone rewards) altruism, honor, or civilization. You can play any sort of character you want -- there are no restrictions in that regard -- but most traditional fantasy archetypes would be fish out of water. Carcosa's a bleak, brutal place and I expect that bleakness and brutality will very quickly color the way people play characters within the setting. "Carcosa isn't a setting that explicitly lauds (let alone rewards) altruism, honor, or civilization." While that's true about the overall setting, it needn't be true about any particular culture within that setting that any PC might come from or adventure within. That's still completely up to whoever's running the game. "...most traditional fantasy archetypes would be fish out of water." Again, it only seems that way if you consider only the overall world situation. There's no reason why whoever's running the game can't put places within that world where traditional fantasy archetypes would fit right in. "Carcosa's a bleak, brutal place and I expect that bleakness and brutality will very quickly color the way people play characters within the setting." Not only needn't any particular locale on Carcosa be either bleak or brutal, but only the most extremely unusual of characters would have more than the slightest inkling of how bleak or brutal the world is overall. And, anyway, only a small fraction of the people I've ever played RPGs with have ever just gone along with whatever's been 'normal' in any of the game-worlds I've run. Almost all of them have tried to force their own worldviews upon those worlds. Ed, for me it might not be enough that "whoever's running the game" can "allow" PCs to originate from outlier cultures. In most of the D&D campaigns I've played in, there was a sense that no particular moral outlook was expected beyond a willingness to kill monsters that attacked you. "...for me it might not be enough that 'whoever's running the game' can 'allow' PCs to originate from outlier cultures. In most of the D&D campaigns I've played in, there was a sense that no particular moral outlook was expected beyond a willingness to kill monsters that attacked you." First, if you're going to play RPGs – ANY RPG – then you’re always going to be in the position of having to accept whatever whoever’s running the game will allow in their game – or run the game yourself. Second, in regard to Carcosa, it’s not that characters would have to either be from ”outlier” cultures or have a particular moral outlook. It’s that, on Carcosa as written, there is no dominant culture or prevailing moral outlook. There are so many isolated tribes of people that whoever’s running the game could say there’s at least one that suits any moral outlook any player might want their character to have. Finally, ”no particular moral outlook was expected beyond a willingness to kill monsters that attacked you” sounds exactly like Carcosa to me. If I were to liken Carcosa to a novel it would be Cormack McCarthy's 'The Road': almost unbearably bleak; but, as Geoffrey says, pierced with faint rays of hope. That this hope involves unleashing horrifically destructive technologies says a lot. The high-tech artifacts of the Space Aliens are mankind's ace up the sleeve. In what is perhaps mankind's only stroke of good luck on Carcosa, the Space Alien armada that made a hard landing on Carcosa had a lot of powerful high-tech stuff that humans can easily use (and steal)." And there's your campaign game! :) Like the D&D campaign world Midnight, it is intriguing to run a world where the basic support most adventurers take for granted is not available. I think this is a great setting for experienced players who are jaded by the same old same old. Another good idea is for "regular" D&D characters to be transported to Carcosa; the setting seems to really support this "fish out of water" type of game, where traditional fantasy tropes battle against impossible odds to bring freedom from the dark gods to Carcosians. From conversations I have had with Geoffrey in the past about extending the original Holmes rulebook into a campaign in itself (i.e., there are no levels above 3rd level which is the highest level you can accomplish) I suspect characters in Carcosa rarely survive beyond 2nd level unless they are lucky, well played, and goal oriented (and the entire group is similarly goal oriented) and I bet that's exactly how Geoffrey planned it. What D&D player/DM of a few decades of experience doesn't look on such a setting as perhaps the most challenging of his/her career? As a fan of the original digest version, I look forward to the new version of this setting! "What D&D player/DM of a few decades of experience doesn't look on such a setting as perhaps the most challenging of his/her career?" The ones who see it as "frustrating" instead of "challenging". The high mortality of characters doesn't surprise me. If you look at the book from a utilitarian standpoint, you'll quickly realize that there's no place in the world of Carcosa to set a low-level campaign. I've seen low-level characters manage to survive or flee the occasional 8 HD to 15 HD monster. But when the game world is serving up a steady and almost unrelenting diet of them? Yeah. 1st and 2nd level characters are dog chow. "...there's no place in the world of Carcosa to set a low-level campaign." Are you not aware that the provided map shows only a small part of the world? And that even the described encounters on that map are only the suggested highlights for each area? So there's no reason why adventuring on Carcosa need be "a steady and almost unrelenting diet of" of 8-15 HD monsters. All it takes for there to be places for low-level campaigns on Carcosa is for whoever's running the games to put them there. And yet most of us pay money$$$ for game products so we can use what's in them. What you seem to be saying is that Carcosa is perfectly fine for any style of play, as long as you take the time to add things to support that play. If doing that, why play Carcosa at all? Why review it or talk about it? "...most of us pay money$$$ for game products so we can use what's in them." Yes. Exactly. And Carcosa has LOADS of stuff in it that can easily be used either as is or modified and either as parts of a complete Carcosa game or by themselves. "What you seem to be saying is that Carcosa is perfectly fine for any style of play, as long as you take the time to add things to support that play." Not ANY style of play. (I don't think, anyway.) But a much wider range of styles than people who focus on only the world-situation of Carcosa tend to assume. "If doing that, why play Carcosa at all? Why review it or talk about it?" Because not everybody wants game products that do ALL of the work for them, to run as is, complete & unmodified, like a computer game. Many people want game products that are easier to modify to their own styles of play -- frameworks, toolboxes & inspiration instead of overwhelming information overload. "Are you not aware that the provided map shows only a small part of the world?" ... are you actually suggesting that Carcosa includes low-level adventuring areas because you can just make up a completely different area that supports low-level adventuring? That's a truly... fascinating... permutation of the Rule 0 fallacy. In related news, I also have to congratulate Carcosa on its impeccable simulation of American football; its ability to make macacroni and cheese; and its controversial decision to fully support the F.A.T.A.L. game system. "... are you actually suggesting that Carcosa includes low-level adventuring areas because you can just make up a completely different area that supports low-level adventuring? I'm saying that your claim that "there's no place in the world of Carcosa to set a low-level campaign" is false because the book & map describe only a small part of that world, and only as inspirational suggestions at that. So there's actually more places in the world of Carcosa where you can set a low-level campaign than there are places where you can't. All you have to do is use the book as an aid to your imagination, not as a limitation upon it. I don't have the book yet. But the way I see it, you don't need to use Carcosa as your primary setting. It's the place your mid level group visits through a mysterious portal (perhaps chasing a villain to retrieve some artifact) and by the time they return home they say to themselves, "I am so glad we don't live there." I think it deserves a better score in the utility department. There's some really great stuff in there to use even if you are turned off by the idea of a "Carcosa campaign". 1. The best, most straightforward psionics system ever. 3. The hex descriptions are great for any science-fantasy setting. I roll a d24 and a d16 and look up the hex to see what things PCs might encounter as they are exploring the wilderness. 5. The included adventure is very good. * Use it as-is for a ready-made campaign. * The player characters in your regular campaign have been transported by a curse to a terrible location: Carcosa. * Use Carcosa as a change of pace or for one-shot games. * Cherry pick contents (whether monsters, the psionics system, the dice conventions, various encounters, the sorcerer character class, or etc.) to use in your regular campaign. * Simply read the book as inspiration for your own creations. I agree with you. There is a lot more utility here than meets the eye. Your comments regarding the psionics are no exaggeration. I love this product and it's the first thing in literally YEARS that has made me want to run some variation of D&D. As for the hopelessness, I really don't see it any more hopeless than "Call of Cthulhu" (before tweaking it to fit your tastes and campaign) which I love. A really well written review James, the only 'quibble' I have (outside of personal tastes) is that as Aplus states, I think there is a lot more utility there than your rating reflects even for people who don't want to play Carcosa as a main campaign. Also, you could pair a Carcosa campaign with a more cuddly Lovecraft Dreamlands campaign (whenever the characters go to sleep, for example). The Dreamlands could give people hints and hope, or at least a change of pace. I have toyed for the last year or so of checking out Carcosa (the first and perhaps only OSR product I would actually buy), and don't mind the hopelessness and all. But it's things like classic gray aliens from Close Encounters riding on the backs of dinosaurs that made it hard for me not to picture in a cartoonish way, taking away from those choice hopeless elements for me. I love the idea of Cthulhu cycle ideas, monsters, and gods in a science fantasy setting. I'm thinking that I can just come up with my own similar setting and campaign using 1st edition D&D (keeping certain character classes Carcosa leaves out), and either leave out the aliens, or make them less like types that have been cliched long before even the X-Files got ahold of them. I thought the same thing (about the Aliens and Dinosaurs and such) until I read it and now (although I still probably won't use them in my campaign very much) it seems far less cartoony and more like a really F'd-up bad acid trip that would make Hunter S. Thompson cry like a little girl. "...it's things like classic gray aliens from Close Encounters riding on the backs of dinosaurs that made it hard for me not to picture in a cartoonish way..."
I had the very same problem with it -- until I saw Rich Longmore's art depicting his vision of Carcosa. Then I understood how it could be so gonzo without being cartoonish. This idea appeals to me a lot. We're going to re-do the PDF so it displays as single pages. Anyone that's already bought it will of course be able to re-download it in the revised form. I'll update the LotFP blog when it's ready. Wow, thanks! That's really gratifying. Is there a reason to not give people both? Ed Dove does make a good point in that in its current form it's perfectly suited for reading on PCs. And again, thanks from someone who loves your work. You're a big reason I'm playing D&D again after all these years. That's exceedingly gracious of you to say after I said I couldn't care less about something that matters a lot to you. I'm impressed and will try to emulate your excellent example. "...in its current form it's perfectly suited for reading on PCs." Yeah... But people like me who prefer the page-spread display can get that from a single-page format PDF by pulling down the "View" menu, going into the "Page Display" sub-menu, and selecting "Two Page View". So the only thing they'll need to do to make it so people like me can keep seeing almost exactly the same thing we're already seeing is just put a blank page after the front cover and before the back cover. That way, all the page pairs will still display as they do now. And, even if they don't do that, the only change will be that we'll see the pages paired differently. That's all. @Ed: You're very welcome. Grace is something I'm not often accused of. Thanks! Hopeless, bleak, amoral... I think I'm going to buy this product on the strength of these descriptors alone. Is it possible to buy the hardcover from someplace besides the link given above? I don't really want to 'create an account' just to buy another book. @Dirk: I think later this spring the books will be available through US distributors. in my opinion, the LotFP camp has the best "flavored" stuff coming out on the market right now. theyve taken everything from the more occult aesthetic of old school gaming and brought it to the forefront. good on them. the mix of lovecraft, barker, death/black metal, melancholy, darkness, etc... is ripe for urgent, mature tales of fantasy/horror. jolly fantasy, quasi-capitalist dungeon crawling and excessive militarism has grown extensively boring as a trope (hello, everything). and the podcast interview with the LotFP designer on jenncasts was great. There is very little in the oad&d books that I throw out but the "implicit moral structure" of alignment was the first to go, an utterly useless interfering idea. Carcosa is an excellent work. I have the original and am in no way tempted by improved presentation to "upgrade". "...the 'implicit moral structure' of alignment...an utterly useless interfering idea." If you mean the linear Good-Lawful-Neutral-Chaotic-Evil alignment system, then I agree. But LotFP:WFRP makes good use of the linear Lawful-Neutral-Chaotic alignment system. And I, personally, have found AD&D's two-dimensional alignment system to be an utterly useful enabling idea. "I have the original and am in no way tempted by improved presentation to 'upgrade'." Hmm. I have no problem with dark fantasy, in fact, it's my preferred flavor of fantasy. I just finished up running a campaign of OGL 3.5 Midnight, which is basically Fantasy Flight's take on a world where Sauron wins, and the players get to pick up the pieces 100 years later. Still, with Carcosa, I think my players would wonder when the hell a Call of Cthulhu game broke out in the middle of a game of Old School D&D...and I have a hard time imagining I'd be able to sell it to my gaming group, particularly since, sooner or later, I would turn their old school D&D Clone game INTO Call of Cthulhu. Nice review, but I'll have to give this one a pass. "...with Carcosa, I think my players would wonder when the hell a Call of Cthulhu game broke out in the middle of a game of Old School D&D..."
Carcosa is an alien planet on which primitive warriors learn to use alien technology to fight evil sorcerers & weird monsters. So I'm wondering what part of that would seem like a Call of Cthulhu game to your players? Because none of it does to me. If play on Carcosa reminds me of any other game, it's not Call of Cthulhu, it's Gamma World. Ed...I know you seem to be fanatic about the setting, but it's pretty clear you don't know the origin of Carcosa (or so I'm guessing) and the Hastur mythos. Carcosa is about as far from the goofy post-apocalyptic setting of Gamma World as you can get. Carcosa was a Robert Chambers creation (though he borrowed the names from Ambrose Bierce), which served as one of several inspirations to H P Lovecraft. He even referenced Carcosa, the Yellow Sign, and the King in Yellow obliquely or directly in his stories. Carcosa in Robert Chambers' stories was basically a metaphor for hopelessness. I can't think of anything that sounds more like a Call of Cthulhu game than that. Again, I can see how it would appeal to a lot of players, and heck, I might even enjoy playing in it. But I'd have a better chance of selling my gaming group on playing Rifts than I would a world as bleak as Carcosa. "Ed...I know you seem to be fanatic about the setting..."
Actually, I'm not fanatic about the setting of Carcosa at all. I like it. I find it interesting. But that's it. What I am fanatic about is truth. So I'm fanatically opposed to untruth. That's the only reason why I've put forth so much effort trying to dispel some of the untruths perpetrated against and perpetuated about Carcosa. "...it's pretty clear you don't know the origin of Carcosa...and the Hastur mythos." Wrong again. I do know all that. But, despite the fact that the setting of Carcosa is inspired partly by those sources, actual play in that setting ends up having almost nothing at all to do with them. "Carcosa is about as far from the goofy post-apocalyptic setting of Gamma World as you can get." You are oh so wrong. If you'd ever bothered to actually play in the setting of Carcosa, rather than merely reading about it, then you'd know that. The setting of Carcosa is a gonzo mix of science fantasy & weird horror that ends up playing very much like Gamma World. "Carcosa in Robert Chambers' stories was basically a metaphor for hopelessness. I can't think of anything that sounds more like a Call of Cthulhu game than that." True enough -- at least for certain ways of playing Call of Cthulhu. But it has almost nothing at all to do with actually playing in the setting of Geoffrey McKinney's Carcosa. You're incorrectly assuming that your knowledge of some of McKinney's inspirational sources tells you what playing in HIS setting will be like. It doesn't. Interesting. Maybe I'll have to check this out. "...too bleak and nihilistic a setting for my tastes. It's not just a "hard" setting; it's a hopeless one..."
Color me sold on it. When I began my Carcosa campaign in 2006, the first rules set I used was the "Mutants & Magic" section of Gary's AD&D Dungeon Masters Guide, which gives guidelines for mixing AD&D and Gamma World. Then I moved to the Castles & Crusades rules, then the 1974 D&D rules, and now LotFP. The world of Carcosa is 99.9% the same under any such rules. The AD&D Deities & Demigods Cyclopedia included the Cthulhu Mythos in 1980. Gary Gygax wrote in the DMG (in Appendix N) that Lovecraft was one of the six "most immediate influences upon AD&D". The Dragon #12 included the Cthulhu Mythos in Feb. 1978. Rob Kuntz was using the Cthulhu Mythos in his D&D games before D&D was even published in Jan. 1974. Lovecraft's mythos has been an important part of D&D since the beginning. CoC certainly does not have a monopoly on Lovecraft.